Welcome to our Off-the-Grid Blog. When the boat heaved, shuttered and stalled again yesterday, with green water sloshing over the decks trying desperately to escape through the scupper drains, I really had to ask myself what we were doing out here. We were hit again and again for hours with walls of green water, beating into big seas and not going anywhere fast at 2 knots. My heart sunk as I imagined the worst, that it would take us another week of this maddening pounding just to reach San Diego. Everything is a challenge when it's like that. We don't eat and if we do its crackers or a bar or a cup of tea. Going to the bathroom is a chore in and of itself. Where else does one have to sit on the pot holding onto a handrail with one hand, and bracing with a foot under the toilet and one on the wall. Meanwhile you have to flush in the middle so nothing sloshes out. Then a few hours later, after leaving the currenty Canal Keller behind us, the face of our world changed again and we were free. The seas became more predictable and the walls of water became mere hills rolling beneath us. The wind backed and we were able to clear our hazards so we were pointing and making miles again. We had a decision to make. To go on the outside of Isla Cedros Island reaping the benefits of a better sail angle later with the possible challenge of crappy seas and stronger winds or go the easy run along the lee of Isla Cedros setting us up with a harder beat and confused seas on the north side. Things were looking good so we stuck with it and gambled on the outside. It turned out to be a good call even with winds up to 20 and some sloppy seas. We averaged 5 knots and came over the top of Isla Cedros with a great wind angle to cross Bahia Vizcaino. The weather files were right; it was a good as it was going to get, 10-15 out of the NNW, with occasional winds pushing 20. The Bay is the last spot after Cedros where there can be really nasty conditions. We got off easy, even with the seas kicking up and an extremely frustrating 2 knot counter-current. Last night brought the coldest temperatures we've had so far. Everything was damp and chilly. We sit day and night in our foulies, thick socks, fleeces, and sea boots, sipping tea and nibbling cookies to keep warm as much as pass the time. The wind bites through our clothes and we are grateful to crawl into the warm sea berth of sheets, blankets and sleeping bag when off watch. By morning we were well past the hardest parts and on our last legs to San Diego. It's impossible to tell what time it is with this cloak of gray clouds covering the sky. The light has been sucked out of the once brilliant blue ocean replaced by a sharp graphite gray. We have had many visitors in the last 24 hours. Sea lions barrel through the waves, spinner dolphins race and leap over the swell and some kind of large whales, possibly fin whales, spout and dive. We've got just over 120 miles to San Diego. We're still fighting a counter-current but are hoping on making it to California sometime tomorrow night. The last of the light disappears with the hundred dolphins that just crossed our bow. Hello DK, Are you going to meet up with Bumfuzzle? Long time reader, never commented before. I follow 2 good blogs and this is one of them. I've been reading it off and on for a couple of years. Any chance you'll just turn west when you see the golden gate bridge and do it all over again? That would be tempting for me. Enjoyed reading all your adventures be safe and God bless. I was wondering the same thing Marc was. As of June 15th, the Bumfuzzle's were at the Police docks located at the very far end of the Shelter Island peninsula in San Diego. My wife actually found their blog through your blog last year. It would be cool to have two of our favorite sailing blog peeps meet up! Congrats on the circumnavigation and thanks for sharing it all with us. 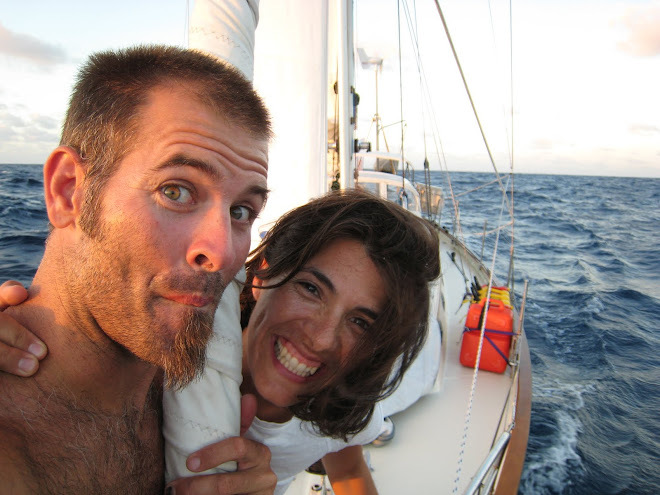 Nicole and Gar, aka The Salty Dawgs, are on a 5 year sailing journey around the world. We left San Francisco in November 2006 and hope to sail back under the Golden Gate Bridge in the summer of 2011. Remember what Bilbo used to say: It's a dangerous business, Frodo, going out your door. You step onto the road, and if you don't keep your feet, there's no knowing where you might be swept off to."